Line a 9 inch pan with parchment. Melt butter in a medium sauce pan fitted with a candy thermometer, add honey, cream and sugar. cook until boiling. Boil for about 50 minutes until thermometer reads 250 degrees. Remove from head and add vanilla. Pour into pan and sprinkle with salt. Allow to cool overnight or until firm and cut into 1 inch squares and wrap in 3 inch parchment paper. In a medium sauce pan, reduce 4 cups of apple cider for 40 minutes until you have about 1/2 cup. Line a 9 in pan with parchment and prepare other ingredients. Once cider is reduced stir in butter, sugar and cream and bring to a boil, stirring rapidly until candy thermometer reads 252, around 5 minutes. Stir in salt and cinnamon and pour into prepared pan. 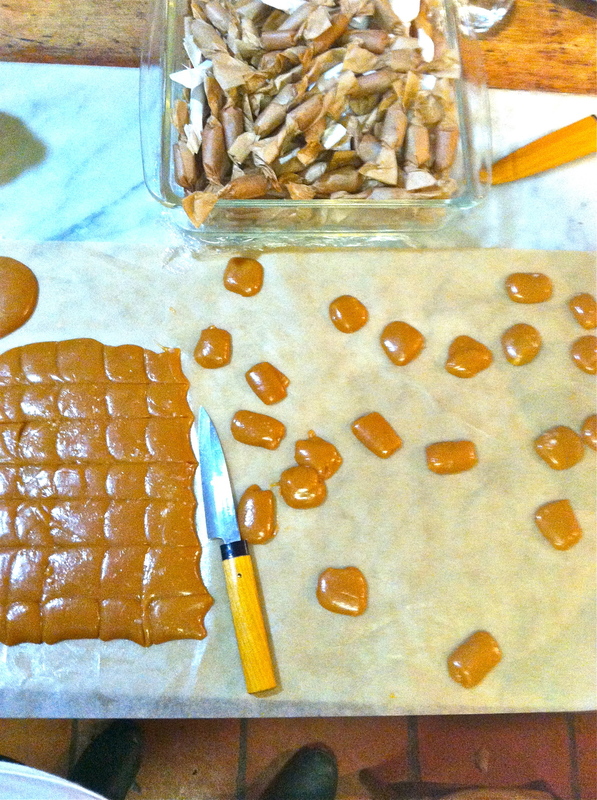 Allow to cool overnight or until firm and cut into 1 inch squares and wrap in 3 inch parchment paper.